Courier services, like every field of activity, has its own specific language and words that help us and our customers communicate effectively, easily transmit information, and quickly find solutions throughout the package travel to destination . It is true, sometimes it seems that we juggle with terms or phrases that may seem to be taken from a foreign language. And we want every moment to be close to you and to be on the same page. That is why today we open the pages of a courier “dictionary”, which we invite you to consult each time the language of our couriers is either unknown or you want to understand it better. AWB (Air Way Bill) – a transport document that accompanies the shipment of each package, for single identification and tracking. AWB Tracking – the action of checking the status of an expedition by interrogating our tracking system for each of the key points: pending receipt from the recipient, taken over by the courier, delivery in progress, delivered to the sender. Tracking can be easily and quickly done online at www.fancourier.ro/awb-tracking/ on our site. Ordering a courier can be done through the FAN Courier Self AWB platform on the client’s account via the “Call courier” section of fancourier.ro or by phone at the number in “Contact” section of our website: 021.9336, key 1. Confirmation Receipt – proof of delivery of an expedition – it can be sent by phone (by communicating the name of the person who received the shipment) or scriptically (by sending a copy of the confirmed document, using the oPOD service or sending an official confirmation note). Compensation – the amount of money granted by our company under FAN Courier terms and conditions for non-conforming situations (damage to properly shipped expeditions, lost shipments, free shipping for delay of deliveries, etc.). Collector Account – FAN Courier service that requires payment of reimbursements to the sender’s account. The refund is returned to your account within 2 business days from delivery date. Check on Delivery – FAN Courier service that offers the opportunity to open the order on delivery and to check if the ordered products are appropriate without checking / technical proof at destination. This service involves the payment of an additional fee to the standard rate. COD (Cash on Delivery) – payment on delivery. Option chosen by the sender, whereby the payment of goods and services is made to the recipient. Delivery code – a unique password consisting of 5 alphanumeric characters through which you can get into possession of the package. You will receive the code by sms / email. Authorization of store or lockers delivery is done exclusively through these codes and ID cards. Only valid for Collect Point and eBOX. Insuring the expedition – an expedition can be secured by paying a percentage of the value of the insurance. In case of loss or damage of an appropriately packed expedition, the customer is 100% compensated. Invoice – fiscal proof of payment for courier services. Loco – picking up and delivering an expedition within the same city. We mention that Loco refers to picked-up and shipped expeditions within the same city and does not necessarily mean a quickly delivery. Sorting – distribution of the shipment by the address to which it is to be delivered; sorting shipments based on their address. Notice – notifying the recipient of an attempt to deliver to the address. Package – package-type correspondence, labeled with sender’s and recipient’s data, entered into the FAN Courier system based on an AWB. 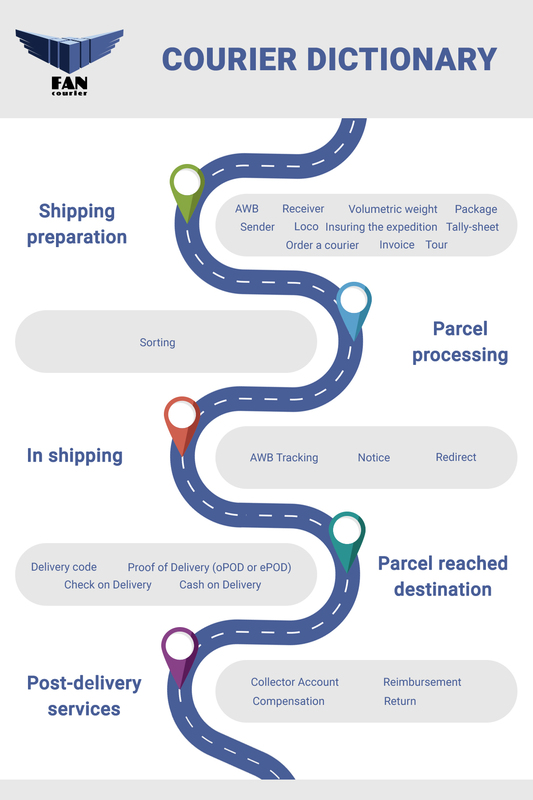 More about packing, preparation for shipment and delivery of packages can be found in our “Perfect Package” article: https://www.fancourier.ro/en/coletul-perfect/. Packing list – a statement containing information about the sender and the products in the package (sender’s data, product name, codes, value and status – new or second-hand products). It is drawn up for shipments sent via the Check On Delivery service and for shipments sent by individuals with insurance value and / or cash refund. Proof of Delivery (POD) – receipt. It can be original (oPOD) or electronic (ePOD). Receiver – individual or legal person who is to receive an expedition. Reimbursement – the amount of money requested by the sender in exchange for delivery of the package to the destination. In the case of expedited shipments, delivery is conditional on the collection of the refund from the recipient. On shipment you can choose to receive your cash or your account. Redirect – changing the delivery address from the initial one. In case of delivery requests in another locality, additional costs may occur. Return – the route of return of an expedition back to the sender in the event of cancellation of the order or the impossibility of delivery. Tally-sheet – the list of expeditions handed over to the FAN containing expedition data. Tour – the shipping route of an expedition from the sender to the receiver. Sender – individual or legal person who sent an expedition. Volumetric weight – specification of a package that contributes to the shipping cost. If the expedition is bulky but relatively light in size, the volumetric weight obtained by the formula: length * width * height / 6000 will be charged. Dimensions in the formula will be noted in centimeters. In the case of determining the taxable weight, the largest weight of the physical weight determined by the weighing and the volumetric weight determined by the above formula shall be taken into account.